Reinventing the original Indian shoe is a label called Fizzy Goblet. They create handcrafted camel leather juttis with contemporary prints and a cushioned sole. 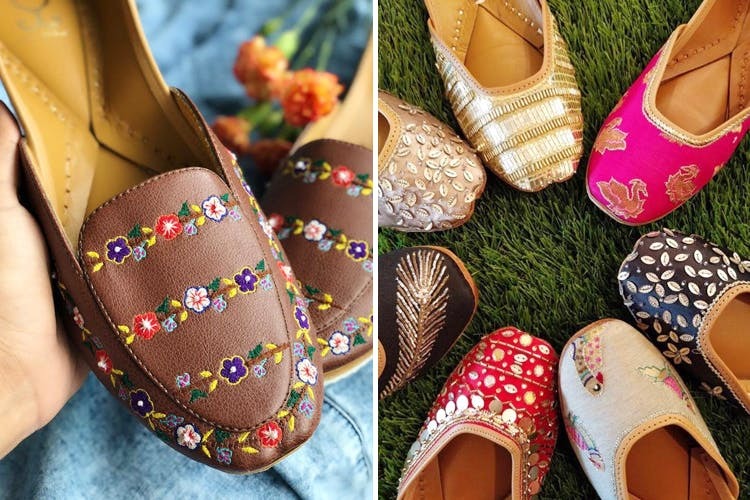 The founder, Laksheeta, started off by painting plain white canvas shoes, just to add a dash of colour to her daily wardrobe, and one fine day she thought of experimenting with juttis, which gave birth to Fizzy Goblet. Their philosophy is to draw from their roots, supporting local artisans in the process–we love it! Whether it’s the combination of brogues and juttis (hello, versatility) or the wedding collection in royal colours and embellishments, there’s a wide range to choose from–you can go the traditional route and pair it with Indian wear, or step out of the box and create an unorthodox ensemble. All we’re saying is, you should! Apart from the juttis, they've also got slip ons, brogues, loafers, sneakers–all of these in a jutti style. We say you give these a look, too. We wish they had a brick and mortar store for the people who like to touch and feel the product before buying it. Having said that, they do have a solid return policy in place, so it shouldn't be a problem. They'll even make a custom sized pair of juttis for you–just contact them via their website.They also recommend choosing a snug fit as leather expands after a couple of weeks of wear.